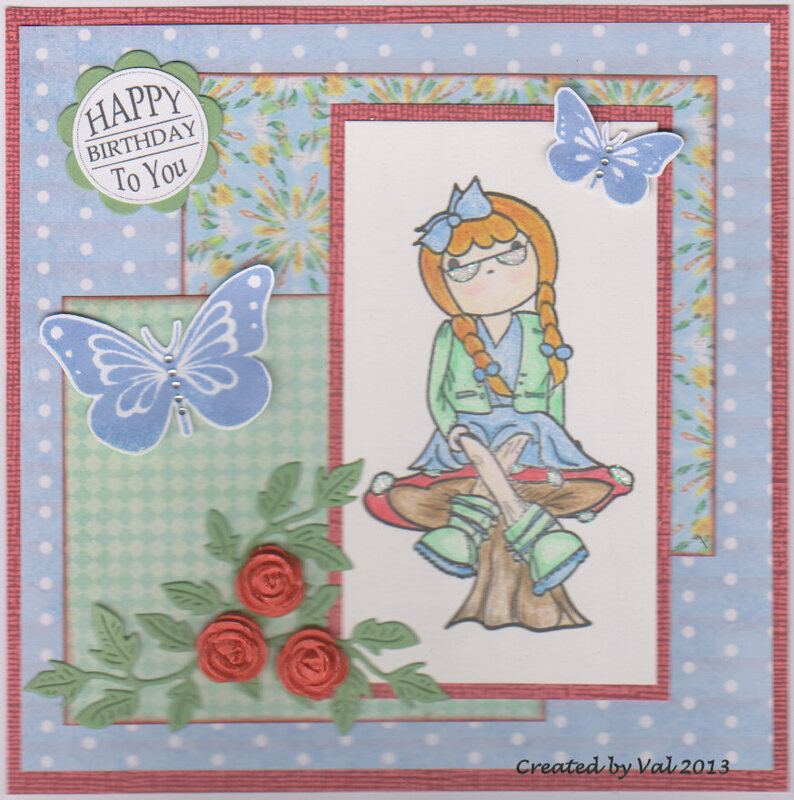 As the theme this time on Addicted to Stamps is 'anything goes' I decided to show this card which should fit the bill. The image from Polkadoodle is one I'd stamped a while ago which came to the surface during my tidy up and hadn't been coloured. I used Coloursoft pencils and then added a bit of glitter to her glasses and the spots on the toadstool. Various oddments of paper were gathered together and combined along with some paper clay roses (coloured with Distress marker to match) and a couple of stamped and cut out butterflies. These had been made ages ago when I acquired the stamp set from Clearly Besotted and were lurking in a little plastic box just waiting to be rediscovered! 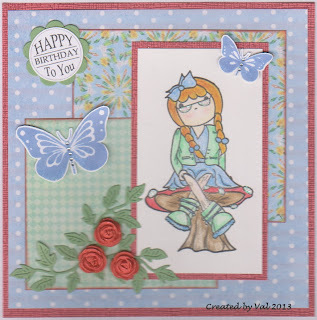 A beautiful card Val, and such a cute image too. I really must have a clear out of my scraps. Your rediscoveries are being put to good use & I do like the way that the butterflies echo her hair ribbon. Wonderful card!! Isn't it great when you re-discover stamps! Love the idea of adding glitter to the glasses and the toadstool! I love it - the image, the colours, the butterflies and you aren't half tempting us with those roses! Just as cute as it can be with beautiful paper and embellishments. A sweet card - I love the layout with all the wonderful layers. Thanks so much for joining us this week at ATS&M.